Smoking cigarettes is not good for any part of your body. In fact, it is patently and unquestionably bad for all of your body’s essential functions – the health of your teeth and gums being no exception. If you are a smoker, why not make 2016 the year you kick the habit? Your body, your family, and those around you will all benefit from the effort. Smoking is a known risk factor for gum disease. In fact, smokers are much more likely to develop advanced periodontitis, a form of gum disease that leads to tooth loss and bone necrosis. To make matters worse, smoking already causes bone loss in the jaw, increasing risks of tooth loss and jaw collapse. Smoking accelerates the colonization of bacteria in plaque and tartar, leading to increased risks for tooth infection and decay. It is also a known cause of oral cancer, chronic bad breath, and dry mouth. 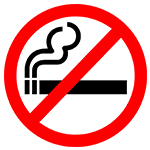 For these reasons and so many more, Garner family dentist Dr. Adam Moore strongly encourages our patients to quit smoking. Nicotine staining is tenacious and can prove impossible to lighten with topical solutions. This means that most smokers have dingy and yellow teeth at all times. What’s more, smoking increases risks for black hairy tongue and leukoplakia, both of which can appear off-putting and significantly diminish from the quality of your smile. Many of these issues can be addressed once smoking has stopped. Dr. Moore would be happy to create a cosmetic dentistry plan that restores your smile as soon as you have successfully kicked the habit. To schedule a smile restoration consultation at our Garner, North Carolina office, please contact Moore Family Dentistry today.